enchlop tools arc great space savers, but they can still 1311 a small shop in a hurry. 'Ih.it became clear to me one flay when I realized I had more tools than I had open bench tops ro put them on. So after clearing out a small space to do some drawing. 1 came up with this loo! stand. It docs double-duty by flipping its lid. "What makes this stand different from most others is that you can mount tools OU bolli sides oithe top. 'lhen when you want to use a different tool, all you have to do is flip the lop ISO". 1 used my stand to hold two lools 1 was tired ofhoisting on and oil my bench. My planer is fastened to one side and my power miter saw is on Ihe oilier. 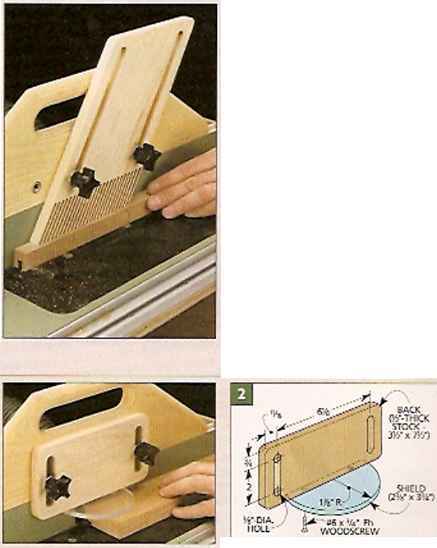 But this stand would also be a grcar home for a .grinder, benchtop jointer, sanding station, or even a dovetail jig. locking knobs. Once you've got the top flipped lo the right tool, you want to make sure it stays pur. So there's a buill-in locking system made from readily-available hardware. Simply tighten a plastic threaded knob al each corner to secure ihe phtlorm in place agaiusl lite sides. That keeps it from rolaling while you're using a tool. rotating the stand. One Ihing to keep iu mind as you use the stand is lliat ihe tools mounted to il aren't likely to balance each olher perfectly. So when you release the locking syslem. the top will probably want to rotate. For this reason, always keep a firm jjrip on ihe tool before releasing the lasl lock. plywood. The stand is buill almost entirely out of plywood. And it's sized so thai you can ait all the pieces out of a single 4' v 8' sheel. 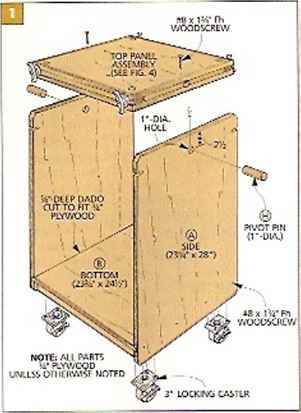 You'll also need just a few strips of hardwood, ami a couple short lengths of dowel lo use as the pivot pins for the top. Since there's no fancy joinery (jnsr a couple of dadoes and some screws), you can probably build this stand in about a day. casters. 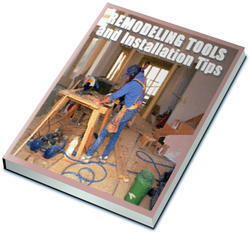 In a small shop, mobile tools help you maximize space. Rut putting two tools on one sland can maker for a heavy unit. So lo make the stand easy to move. I mounted it on heavy-duty casters. Once you've rolled the stand ro where you need it, just step on a lever o:i each caster to lock il iu place. 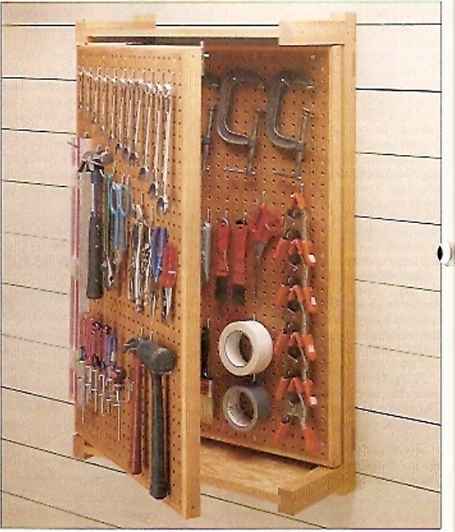 hardware-The bulk of the hardware used in this project should be easy to find at most hardware stores or home centers. 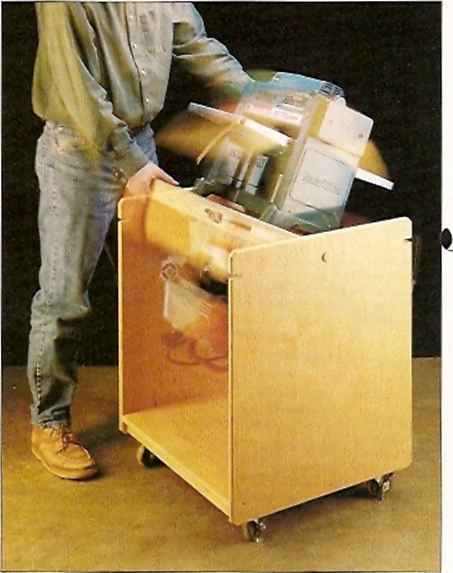 However, the plastic threadei® knobs and swivel casters may r.ot be car-ried by some stores. If you have trouble finding them, a number of mail order sources are listed on page 1J 2. 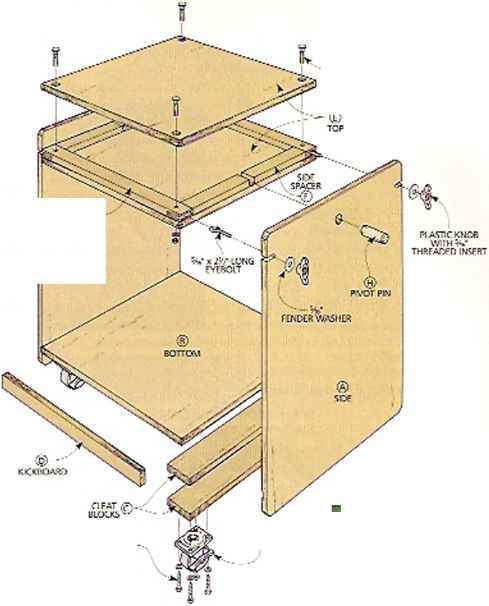 The base of the stand is nothing more than a couple of thick plywood sides (A) joined by a bottom (1J) (Fig. 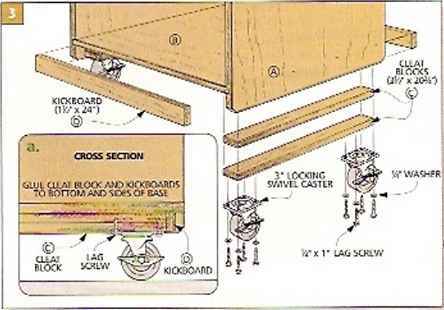 i).Then cleats are added to the bottom, and casters are fastened to the cleats. Note; Before starting construction, measure the bases and the heights ufilie took you plan to mounttothe stand. You may have to alter the staud's dimensions to accommodate your tools. Alter the sides aud bottom are cut to size, the sides can be notched and drilled tor the lockhjg hardware and top pivot pins (Fig*. I aud 2a).To cut each slot. 1 drilled a dia. hole to mark the end. then removed the waste with a jig saw. A Vi"-deep dado Cut on the i nside face of each side holds the bottom in place. But before assembling the three case pieces, small chamfers are routed all around the sides pieces and on the front and back edges of the bottom (Fig. 2h). I also knocked off the sharp corners of each sice panel by culling a Vz" chamfer on each corner. Once this is done, the sides can be glued aud screwed to the bottom. cleats and kickboards. In order to strengthen the bottom of the base and make it more rigid, cleat blocks and kick boards are added- The cleat blocks also provide extra thickness for the lag screws that hold the casters. Tiie cleats (C) are glued up from two picccs of3/*" plywood (Fig. 3). These are glued in place against the sides and bottom. Iben plywood kickboards (D) are glued to the ends of the cleats at the front and back of the base. To mark the positions for the pilot holes for each caster, simply hold the easier in place and mark through the holes in die casters plate. After drilling 5/»"-dia. pilot holes, the casters can be attached ti ■ the cleat blocks with '/*r x 1" lag screws < fY-y. 3). Qnoe the liase is finished, all that's left is to build the lop for the tool stand. The top is made our of two layers of plywood with hardwood spacers sandwiched in between (Fig. S). This extra thickness help« keep the base from racking when the locking knobs arc tightened. Cut the two plywood ti»p pieces (E) to size lirsL Then the side spacers (10 and front and back spacers (('■) are cut to size from :,/j"-Uuck liardwood. 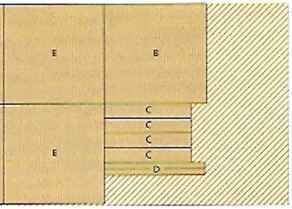 In addition to separating the piywond layers, the irout and back spacers serve another purpose. Notches cut in the ends of these pieces house the eycbolts that lock the top in place (Fig*, i ond a). These notches cau be cut on the table saw. Sneak up on their width until the eyebolts /it smoothly in the notches without being forced in place. Once these notches are cut, the plywood top pieces and the spacers car. be glued up. Then holes fur the locking hardware can be drilled (Fig. 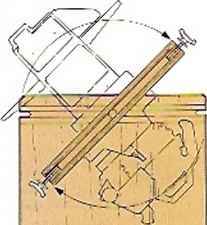 To keep the hardware helnw the surface of the plywood, drill a counlerbore for lite head kit"each carriage bolt and for each washer Kind lock nut (Fig. 5). lock-downs. With the exception of the large plastic wing nuts, the lock-downs at each corner of rhe top use common liardware. An eyebull fits iuto the slot cut in each corner of ihe top and Is held iu place by a carriage bolt, washer, and nylon lock nut (Fig. it). A large feitder washer and plastic wing nut are threaded onto the eyebolL (Fig. 5). The wiug nuts are then tighten«! down against the sides to lock the lop in place (see photos aliove). lobek the iop in pi-JCe, lighten tficktiob !u (hp ihe iou, kxaen (he knobi ond a: finch mnrtpr against rhf side. swing the eyebO'K out of 'he notches that pass through the sides of the base and into holes drilled iu the edge of the top (Fig. 6).To locate the pivot pin holes in ihe edge uf tlie top. 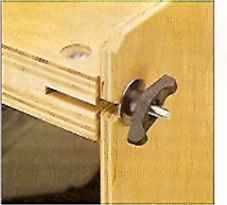 just place the top between the sides of the base 3nd secure it in place with the locking hardware. Now. using the hole in each side of the Ixise as a guide, drill holes iu(u the edge of the top. Ihe pivot pi ns are nothi ng more than short sections of T-dia. liardwood dowel After chamfering the ends, the pins can he slipped through the sides and into rhe lop. Then each one is secured by a single screw (Fig. fa).